Watch the video or read the written report. Presentation time: 62 minutes. After watching, please complete our two-minute survey! Three individuals with spinal cord injuries talk about their experiences traveling after injury and share tips for making travel successful. Presented on March 8, 2011 at the University of Washington Medical Center. Travel tips, travel checklists, accessible travel websites, travel and tour companies, accessible vehicle rentals, travel "philosophy" and more. 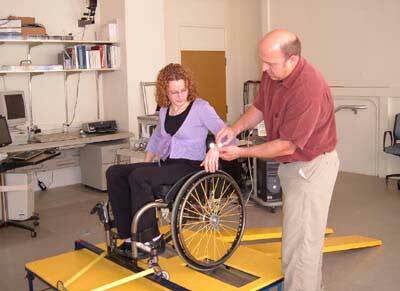 Portland, Oregon resident Caren Van Kleek sustained a C5-6 incomplete spinal cord injury 19 years ago. Three years ago she started All About You Travel, which specializes in travel for people with disabilities. The key to successful travel for anyone, she said, but especially for people with disabilities, is to plan ahead and ask lots of questions. When researching hotels, don’t just ask if a room is accessible. “Focus on your specific needs,” she advised. “Do they have any rooms with roll-in showers? Can they provide a shower chair? Do they have a hand held shower? What are the dimensions of the bathroom?” You need to be able to get your wheelchair in it and turn it around. Don’t forget to ask the hotel how wide the doorways are. Know all the dimensions of your wheelchair so you can find out if your chair will fit. Ask about the height of the bed and the amount of space between the bed and the wall. “One of the best people to talk to is the head of housekeeping,” Caren said. If the bed is too high, talk to them about options. “Ask to talk to someone in the hotel’s engineering department, because they can be your very best friend,” she added. For one of her clients, the engineering department removed the Hollywood bed frame to lower the mattress height. You can also ask the hotel to take pictures of the room and email them to you so you can get an idea of the layout. Once you’re actually at the hotel, don’t hesitate to ask for help. For instance, extra chairs or tables in the room can just get in the way. If that’s a problem, call the front desk and ask them to remove some furniture so you can maneuver around the room more easily. You need to advocate for yourself every step of the way. Chris Curtis agrees that asking for help—all the while staying pleasant and upbeat—goes a long way toward making travel comfortable and enjoyable. Curtis has a C5 incomplete spinal cord injury, uses a manual wheelchair and has traveled extensively domestically and abroad since his injury 5 years ago. 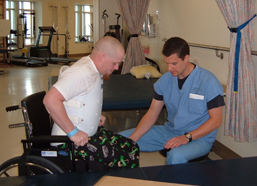 Joe Meyer sustained a C4 incomplete spinal cord injury six years ago. He lives with his wife and two young daughters. “In the 6 years since I've been injured, I've probably flown 5 or 6 times around the country on a variety of airlines and have been generally pretty happy with the them.” But it can be unpredictable, and you need to anticipate problems. Although Chris doesn’t usually check ahead to get details about a room’s accessibility, once he arrives at the hotel, “I will ask to see the room before I check in, to see if the bathroom works for me." For instance, on a recent trip to Portland, the room he reserved had a bathroom that was too tight to maneuver in. “I asked them if they would take the door off, and generally they'll do that, but this hotel wouldn’t.” He ended up switching to a different hotel. No matter how well you plan, things can go wrong. Joe’s story of the airline losing his wheelchair is amusing now, but at the time it felt like a crisis. He was traveling to San Diego with his family, with a stopover in Salt Lake City. “I'm guessing that my chair went on last so it came off first when we landed Salt Lake,” he said. “And they didn't put it back on the plane. We landed in San Diego, and my chair just wasn’t there.” Inexplicably, the airline put the chair on a flight to Portland. The airline supplied him with a wheelchair right away—not a good one, but he was able to make do for a short while—until his own chair arrived the next afternoon. “They were very good about it,” he said of the airline. “It wasn't great, but it all worked out about as well as it could.” As compensation, the airline gave his family several hundred dollars’ worth of vouchers for future air travel. When an airline broke Chris’ wheelchair, “they were very good about it and paid for repairs right away.” On another trip, Chris was thrown from the transporter chair while being pushed by airline staff along the jet way. He wasn’t hurt, but “a lot of panic ensued, with people running around trying to get me back in the chair as fast as possible. I had to get everybody to stop rushing around and start listening to me.” Once he got their attention, he was able to reassure them that he was fine and give them instructions for getting him back in the chair. “I pack a lot of stuff because I require a lot of stuff,” Joe said. “We have a big long list, including what I might need for contingencies. We bring a set of tools. If there's a chance you might need something and you're not going to be able to get it on the other end quickly, you probably want to take it with you.” Airlines don’t charge luggage fees for durable medical equipment, like a portable shower chair. The newer trams throughout most of Northern Europe are generally like our Light Rail here (in Seattle), Chris said. “A ramp comes out at sidewalk level, and they're pretty accessible.” He has found trains in the U.S. to be accessible, but hasn’t tried trains abroad. Accessible Vacation Home Exchange for People with Disabilities is a free service connecting people who are interested in swapping homes with other persons with similar needs in other parts of the world (http://www.independentliving.org/VacationHomeSwap.html). 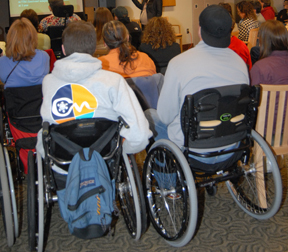 Disability Travel and Recreation Resources: variety of travel resources. Access Aloha organizes tours and provides information for people with disabilities who want to travel to Hawaii (800-480-1143; http://www.accessalohatravel.com/ ). Wilderness Inquiry offers accessible adventure travel opportunities to everyone, regardless of age, background or ability: 800-728-0719; http://www.wildernessinquiry.org . Accessible Journeys plans cruises and operates tours for people with physical disabilities: 800-846-4537; http://www.disabilitytravel.com). Amtrak offers accommodations and discounts for train travelers with disabilities. Call 800-872-7245 or go to http://www.amtrak.com and click “Special Needs & Accessibility” under the “Plan” tab. Accessible Vans of America, has a national network of wheelchair accessible van rentals, sales and service: http://www.accessiblevans.com.